I spend a long time looking at this Carpenter Bee though a lighted magnifying glass. The beautiful copper and gold wings determine I will complete my bug series with it. The abdomen is shiny black and has hair only along the edge. Based on what I’ve read I suspect this one is female. The external body of this bug appears hard and opaque and I try to imply that with a dark contour, but I get so caught up in detailing the organs – it could appear that I have created another sort of bug. My composition is bright and jewel toned. I don’t know that this looks like a Carpenter Bee in general – it seems more like an ant, or a wasp. 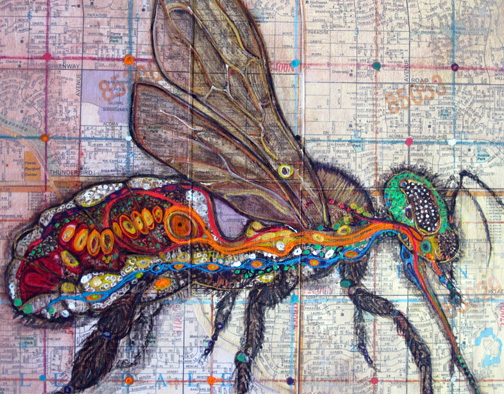 They’re all related – all are of the order of insects called Hymenoptera (hymen – membrane and ptera – wing). Out of curiosity I research bee mythology and in general, throughout time, bees have a reputation as bringers of order. What does it really mean, that they are dying off these days? Are we closing one era of order to bring in another? I’ve enjoyed these bug compositions. It’s an unusual tangent for me. My thought these days is that while we study insects in grade school, we should revisit that study as adults. Life varies and is purposeful – it deserves our respect. 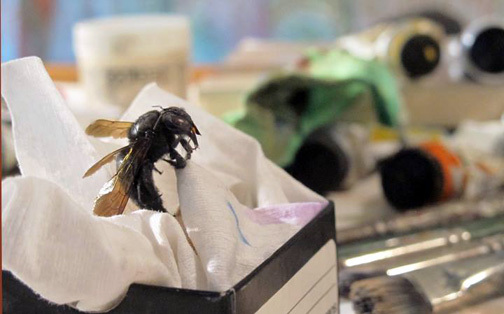 This entry was posted in anatomy, art and tagged anatomy, art, beautiful bugs, bugs, carpenter bee, casein, hymenoptera by monica. Bookmark the permalink. Jerusalem Crickets and Wind Scorpions are my favorite WTF bugs. I considered the Jerusalem Cricket. But wasn’t ready to sit in front of one for a week.